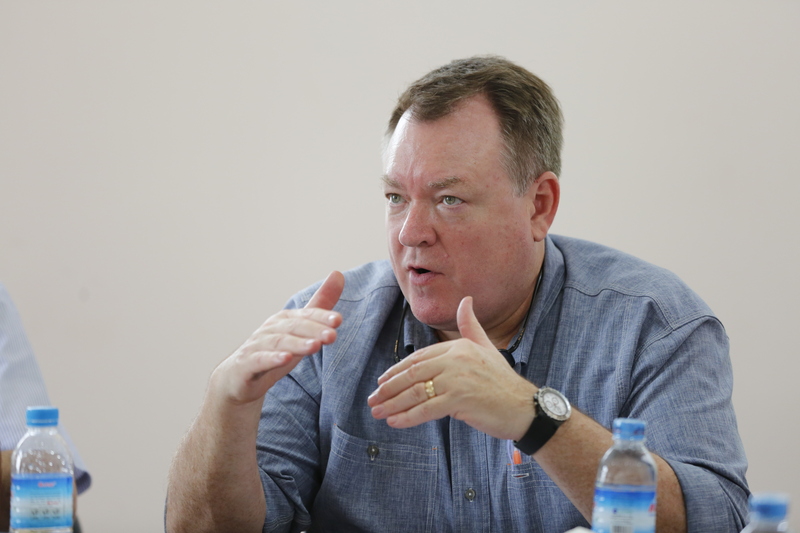 Winrock President and CEO Rodney Ferguson in Burma. It’s 3 a.m. on a monsoon Monday in May. Jet wheels scream as they bite into the soaked tarmac in the Southeast Asian metropolis of Yangon. Winrock President and CEO Rodney Ferguson has been in transit from Washington, D.C., for nearly two days, and his plane is landing three hours late. It’s his first trip to Myanmar, the famously cloistered “Land of a Million Pagodas.” He has come for the inside scoop on how Winrock’s Farmer-to-Farmer and Value Chains for Rural Development projects, both funded by USAID, are successfully connecting smallholder growers to new practices, technology and markets in such a complex, conflicted country. He suspects some hard lessons have been learned by the Winrock crews that work side-by-side with smallholder ginger, coffee and soy farmers in the lush Shan mountains; with the sesame and melon growers in the flat, Dry Zone croplands; and amongst the cattle, poultry and fish farms dotting the countryside. He wants to know more than the dense technical reports or pithy tweets tell him. 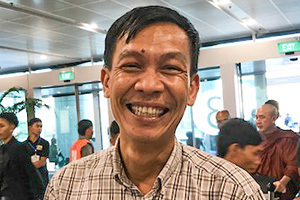 Ferguson clicks through Immigration in Yangon’s gleaming new arrivals hall, and hopes that Winrock project driver, U Myo Min, hasn’t given up on him, yet. Winrock project driver U Myo Min. As always, though, the driver is there. Whether his incoming charge is a senior headquarters executive or a volunteer graduate student, arriving early or late, U Myo Min hasn’t missed a pickup in two years. 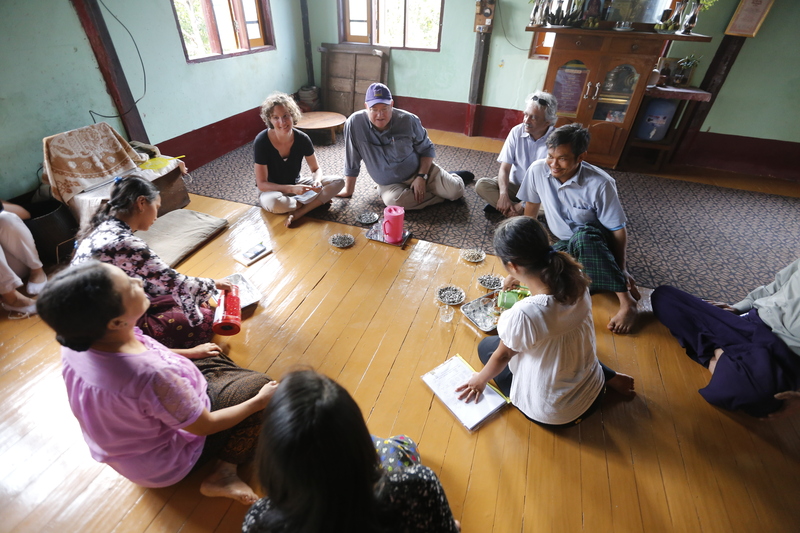 In the blur of meetings and events that followed, Ferguson would meet nearly all of the Winrock Myanmar technical and support team members working for both Farmer-to-Farmer — run by a former John D. Rockefeller 3rd Scholar, Dr. Ai Thanda Kyaw — and the Value Chains project. He sat down with visiting F2F volunteer Bill Nichols, a Harvard Business School graduate and Small and Medium Enterprise expert who had just completed his third F2F assignment in Myanmar — this time, working with a promising women’s group to improve incomes from their production and marketing of an all-natural, cosmetic skin paste made from the bark of thanaka trees. 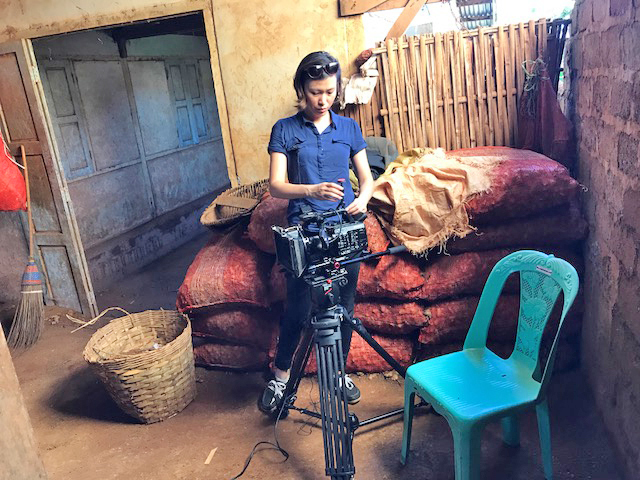 Communications and gender specialist Ma Lay Thida, on assignment near Kalaw. 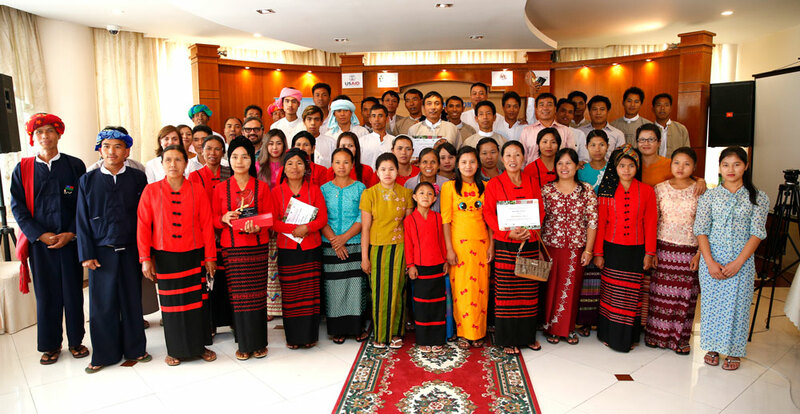 “Your top coffee is now being marketed in Myanmar’s best cafes,” Ferguson told coffee growers at an awards ceremony in Yangon. After the awards ceremony, Ferguson left the hubbub behind to visit ginger, soy and coffee farms in the Shan hills. He traveled with Nimish Jhaveri, the Value Chains project’s new chief of party; Ma Lay Thida, an energetic former Fulbright Scholar who’s involved in outreach and gender programming; and Anne-Claire Degail, the project’s senior technical manager. He interacted with a raft of other smart and motivated Myanmar Winrockers, all of whom are passionate about improving food security, sharing knowledge of improved agronomic practices and scalable technologies, and facilitating new market linkages by introducing growers directly to processors, contract buyers and importers. Ferguson learned firsthand about natural composts that help farmers increase yields while boosting soil health; got an earful about using Rhizobium inoculant to ensure soy plant health; inspected new grain drying machines introduced by Winrock to help farmers earn better prices for better dried grain; and spoke directly with Winrock program officers and project lead farmers about the environmental and production benefits of contour planting, intercropping, spacing and shading on ginger plots. He heard repeatedly about the impact of Winrock’s “people-to-people” based approach to sharing knowledge — farmers from the U.S. working directly with farmers in Myanmar, using hands-on demonstrations to spread information and build momentum for change. 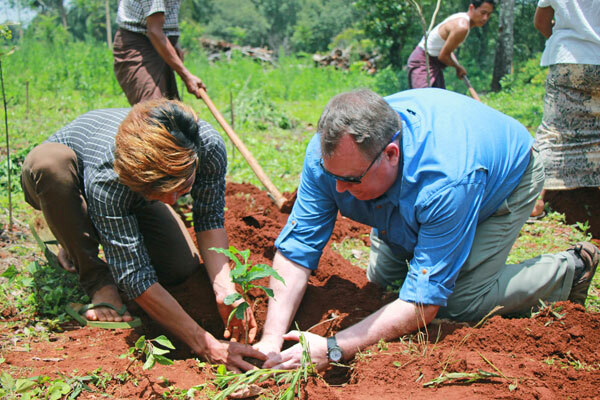 Ferguson helps plant coffee saplings in Ale Chaung village. In remote Ale Chaung village, Ferguson grabbed a hoe and scuffed his knees while helping villagers plant new coffee saplings. The community successfully exported its first few tons of specialty grade coffee this year with on-farm assistance and introductions to high-end buyers through Winrock, doubling the prices it earned last year. As a result, villagers are eager to rejuvenate and expand local coffee plantings before the next harvest. In Kyauktalone Gyi, Ferguson jumped a creek bed to reach a soy field where farmers explained the benefits of using new, locally adapted varieties of soybean introduced by the Value Chains project. The new varieties present growers with more options for planting seeds with varying maturation cycles, allowing growers to cope with Myanmar’s notoriously wet, extreme weather. Clockwise from top left, Senior Technical Manager Anne-Claire Degail, Ferguson, and Chief of Party Nimish Jhaveri meet with growers. When the whirlwind visit ended, Ferguson climbed onto his homebound plane — but only after greeting a group of five incoming Winrock volunteers, who just happened to be arriving at the airport as Ferguson was leaving. The volunteers were embarking on a five-week business management and market strategy assignment to support a pair of Yangon-based tofu and ginger processing firms. Ferguson assured them that their contributions of time, energy and expertise are part of a well-coordinated effort to improve economic productivity in a nation eager to connect to the world. He welcomed them to the Winrock team, knowing they were about to experience an amazing country with incredible potential.